Is there anything Samsung isn't good at? Whether it's components like memory chips, processors and LCD panels or retail clobber like phones and TVs, Samsung is assimilating everything. In that context, two things are immediately apparent. The first is that you'd better not be in the bad books when the People's Republic of Samsung comes into force, as seems to be inevitable. 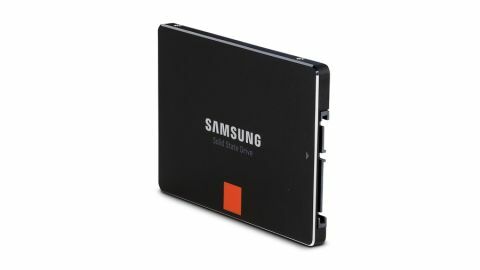 The second is that it should really come as no surprise that Samsung makes damn fine SSDs, such as the 840 Pro we have turning up here in 512GB guise. For starters, Samsung makes its own flash memory. It's the snazzy 21nm Toggle NAND sort, so it's basically about as speedy as it currently comes. Samsung also makes its own controller chipsets, and as far as anyone can tell, those are about as good as it gets too. For proof, look no further than our benchmark results. Fastest sequential reads and writes for both compressible and incompressible data? That'll be the Samsung 840 Pro. It serves up the fastest 4K random read access, too. But the OCZ Vertex 450, among others, beats it when it comes to 4K random writes. This is a very fine drive: not only is it one of the quickest around, it comes with the peace of mind that you're buying from a big outfit that is very unlikely to disappear. If you do have a problem, the odds of being able to cash in your warranty are high. That it's also pretty reasonably priced for a premium drive just adds to the appeal.